The Ascension Lutheran Soup Kitchen opened its doors on October 12, 2010. Since then, it has continued to furnish a hot, well-balanced, and fresh lunch for countless individuals. Everyone is welcome! No ID needed, no note from social services; just come in if you need a meal. Meals are served in a dignified atmosphere similar to a restaurant. Our guests are seated at dining tables and served restaurant-style with a server. The food we serve is provided by local businesses, grocers, organizations, and individuals. We have volunteers from the Dilworth neighborhood and beyond, including our church family, schools, and businesses. 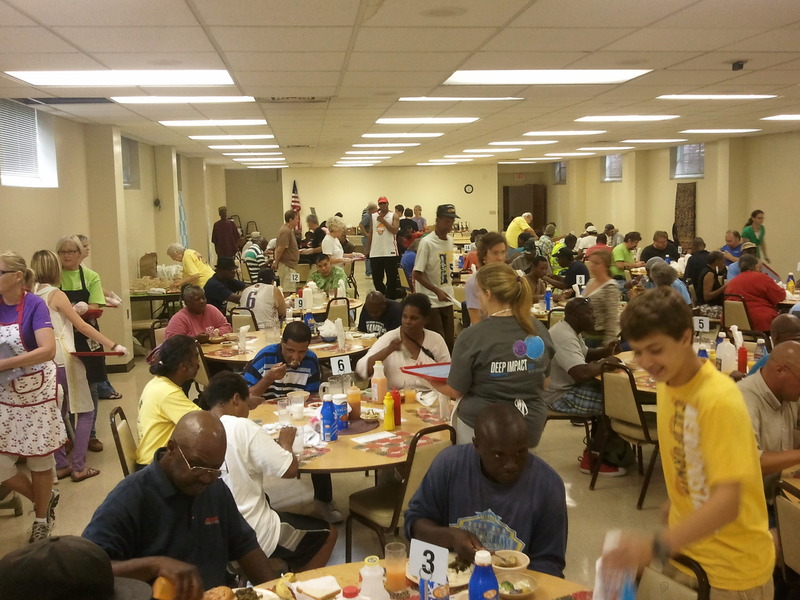 We love, honor, and appreciate everything that our volunteers have done to make this a successful soup kitchen. Join us for lunch on Tuesdays between 11:30 AM--12:30 PM. You are welcome to come in early at 11:00 AM for a brief, 15-minute worship service. Please use the main church entrance off the parking lot. If stairs present a barrier to you, please use the elevator via the "Luther Hall" entranceway. We serve restaurant-style: when you arrive, simply find an empty seat and your server will serve you. Make a difference in our community by volunteering at the Soup Kitchen! We rely on our volunteers in order to provide our community with a healthy, wholesome meal served in a dignified setting. Can't make it on a Tuesday? We also utilize volunteers on other days of the week for food transfer, laundry, sorting, and other miscellaneous tasks. Please come any Tuesday; no advance notice is necessary. See the information below about when to arrive and where to go. Please call or email the church office in advance of your visit, to avoid overstaffing the Soup Kitchen on days when larger corporate, church, or school groups are already signed up to help. Contact information can be found here. Please arrive on-time, depending on the task you intend to fill; refer to the table below. We recommend closed-toe shoes and clothing appropriate for serving food. Aprons and gloves are provided. Children are welcome and encouraged to serve a table, but they must be assisted by an adult if they are younger than age 12. All new volunteers who wish to serve a table must go through a brief training session, which begins every Tuesday at 10:00 AM. *With the exception of Serving a Table, we can usually be flexible if you need to leave earlier than what is listed. Serving a Table is the only assignment that requires the same person to fulfill the job from start to finish. Ascension Lutheran Church is located at 1225 E. Morehead St., Charlotte. For more information about how to get to Ascension, visit our contact page. The Soup Kitchen is held in Luther Hall, the church basement. After parking in the parking lot, go through the exterior entrance marked "Luther Hall" and take the elevator down to the lower level. The Ascension Lutheran Soup Kitchen operates as a ministry of Ascension Lutheran Church, however, the Soup Kitchen operates entirely on donations from our community in order to operate, and does not receive funding from the general operating budget of Ascension Lutheran Church. Financial Donations of any amount are greatly appreciated and are used to offset the costs of purchasing foodstuffs when donated supplies are insufficient. Please contact the church office if you would like to make a tax-deductible financial contribution. In-Kind Donations of food or equipment can be made, as well. If you wish to make an in-kind donation, please contact the church office so we can arrange the pick-up or receipt of the donation.